Sabetha 42, Centralia 7 – Sabetha used a strong running game and a stout defense to blow past Centralia 42-7 in the opening round. Brock Fey rushed for 150 yards and a touchdown for the Blue Jays. Silver Lake 49, Pleasant Ridge 0 – Dalton Dultmeier passed for 222 yards and two touchdowns as Silver Lake blanked Pleasant Ridge, 49-0. Dultmeier also rushed for 96 yards and a score. The Eagles held Ram quarterback Nick Holmes to 53 rushing yards on 25 attempts. Wellsville 63, Erie 0 – Trailing 6-0 in the first quarter, Erie drove deep into Wellsville territory only to have the Eagles intercept a Red Devil pass and return it 85 yards for a touchdown and a 12-0 lead. Wellsville would roll from there on scoring 44 points in the second quarter to lead 56-0 at halftime. Neodesha 31, Cherryvale 26 – Neodesha avenged a 20-14 home loss to Cherryvale earlier in the season by eliminating the Chargers, 31-26 on Tuesday night. After an early Charger score, Neodesha built a 14-6 lead on touchdowns runs by Izzy Johnson and McKadin Songer. Cherryvale tied the game at halftime on a Brendan Menzer touchdown run. After a Blue Streak touchdown, Cherryvale’s Lane Raida scored but the Chargers’ two-point attempt failed to keep the score at 21-20. Songer would add another score for a 28-20 Neodesha lead, and Colton Cunningham kicked a field goal to push the lead to 31-20 with under a minute to go. Menzer then returned the ensuing kickoff for a touchdown to pull the Chargers to within 31-26, but Cherryvale could not cover the onside kick. Nemaha Central 56, Riverside 12 – Kyle Rethman rushed for 114 yards and a pair of touchdowns as Nemaha Central rolled past Riverside 56-12. The unbeaten Thunder will host No. 1 Rossville on Saturday in the second round of the Class 3A playoffs. Rossville 49, Maur Hill-Mount Academy 0 – Tucker Horak completed 12 of 14 passes for 275 yards and four touchdowns as Rossville shutout Maur Hill-Mount Academy, 49-0. Horak also rushed for 112 yards and a pair of scores. The Bulldawgs held Raven running back Harry Trotter to 29 yards rushing on 19 attempts. St. Mary’s Colgan 49, Jayhawk-Linn 6 – Colgan rolled to a 49-6 over visiting Jayhawk-Linn to improve to 8-2 on the season. Joe Battitori and Andrew Stewart scored early touchdowns, and the Panther defense set up the offense with short-fields all game. Colgan began subbing early in the second quarter and led 42-0 at halftime before a running clock was instituted in the second half. Josh Hayes returned the second-half kickoff for a touchdown to complete the scoring. Galena 41, Caney Valley 21 – Caney Valley led for the majority of the first half, but Galena played well after the break to win 41-21. The Bullpups led 21-20 at halftime, but Galena eventually took the lead on a 75-yard touchdown run by P.J. Sarwinski early in the third quarter. Sarwinski finished with 128 rushing yards and that touchdown, while passing for 112 more yards and two scores. Wichita Independent 17, Cheney 13 – Wichita Independent pulled off the upset of the night with a 17-13 victory at Cheney for the school’s first ever playoff win. The Panthers led 10-0 early on before Cheney rallied for a 13-10 lead. Independent’s Chris Taylor broke a long touchdown run mid-way through the fourth quarter to give the Panthers the 17-13 advantage. Cheney won the regular season meeting between the two schools, 42-20 back in Week 3. Halstead 46, Southeast of Saline 7 – Halstead throttled Southeast of Saline for a second consecutive season to open the playoffs. Eli McKee rushed for a pair of touchdowns and passed for another as the Dragons improved to 10-0 on the season. Washington County 44, Beloit 34 – Washington County used another second-half rally to improve to 10-0 with a 44-34 win over Beloit. Beloit led 20-6 at halftime before the Tigers scored twice to tie the game mid-way through the third quarter. Beloit scored one play later on a long Noah Smith touchdown run. The two teams would trade touchdowns until Washington County took the lead for good with a score in early in the fourth quarter. Hoisington 76, Cimarron 19 – Cimarron drove the field and took an early7-0 lead at Hoisington, but the Cardinals stormed back for a 57-point win. Hunter Hanzlick scored three times and Tyler Specht added two scoresin the first half as Hoisington built a 55-13 lead at halftime. Wichita Collegiate 63, Conway Springs 6 – Collegiate eliminated Conway Springs for a second consecutive season with a 63-6 blowout on Tuesday night. 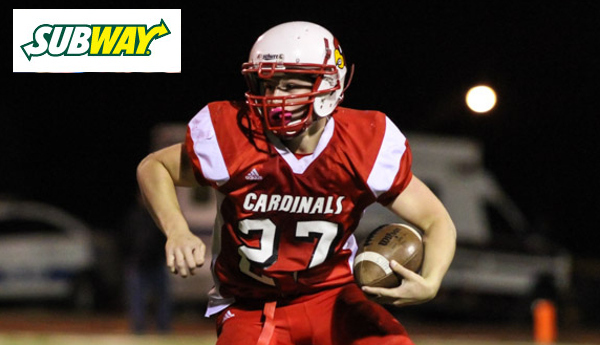 Conway Springs answered an early Collegiate score with a long touchdown pass, but the Cardinals couldn’t keep up after that. Nathan Burgoyne rushed for three touchdowns and caught a touchdown pass for the Spartans. Garden Plain 22, Hesston 21, OT – Garden Plain went for the winning two-point conversion in overtime and quarterback Alex Becker scrambled, reversed field, and found a wide-open Keynan Wright for the successful attempt and a 22-21 win. After falling behind 14-0 in the first half, Becker threw a touchdown pass to Chip Dockers and Wright scored on a short run to tie the game in the third quarter. In overtime, Hesston’s Zach Esau scored on a 1-yard run to take a 21-14 lead before the Owls countered with another scoring pass from Becker to Dockers. That set up Becker’s scrambling heroics on the two-point conversion attempt to give the Owls the win. Norton 37, Marysville 0 – Norton built a 23-0 halftime lead and rolled to a 37-0 shutout of Marysville. Gavin Lively caught a touchdown pass and rushed for a score for the Bluejays. Quarterback Jace Ruder also rushed for a pair of touchdowns in the win. Scott City 54, Lyons 0 – Scott City had little trouble with three-win Lyons in a 54-0 win. The Beavers scored on their first play on a long touchdown pass from Bo Hess to Drake McRae. Cooper Griffith scored three first-half touchdowns and Wyatt Kropp added two more as Scott City overwhelmed the Lions. Central Burden 70, Uniontown 50 – Central Burden handed Uniontown its first loss of the season and ended the banged-up Eagles with a 70-50 win. The Raiders led 24-22 after one quarter and 46-28 at halftime. Central Burden expanded their lead to 54-34 after three quarters and held on for the road win. The Raiders will host Burlingame in the state quarterfinals on Saturday. Burlingame 40, Mankato-Rock Hills 18 – Burlingame and Rock Hills played a defensive minded first half before the Bearcats pulled away. Burlingame led 12-6 at the break and Dalton Sporing scored on a 23-yard run in the third quarter to push the lead to 20-6. The Bearcat defense then returned a fumble 49 yards for a score and a 26-6 lead. West Elk 62, Marais des Cygnes Valley 14 – West Elk became the first team to win a 2015 playoff game as the Patriots used an early start and a big second quarter to advance. The Patriots led 24-14 after one quarter, but scored 38 points in the second quarter to end the game at the half. Armando Gomez rushed for three touchdowns and returned an interception for a fourth score. The Patriot defense also returned a fumble for a touchdown and a safety. Hanover 50, Rural Vista 0 – Hanover built a 30-0 halftime lead in cruising to a 50-0 shutout of Rural Vista. Will Bruna completed 19 of 22 passes for 241 yards and four touchdowns to lead Hanover. The Wildcats will host West Elk in the second round of the playoffs with a chance to get back to the state semifinals for the fourth consecutive season. Central Plains 46, Kiowa County 0 – The Oilers opened their title defense with a 46-0 shutout of Kiowa County. Central Plains led 38-0 at halftime and ended the game with a score mid-way through the third quarter. The Oilers will travel to No. 1 Spearville on Saturday in a rematch of last year’s quarterfinal classic won by Central Plains, 42-40. Spearville 64, Atwood-Rawlins County 14 – Spearville eliminated Atwood-Rawlins County for a second consecutive season with a 64-14 win. The Royal Lancers led 50-14 at halftime as Brandon Davis and Luke Heskamp each had a pair of touchdown runs. Nathan Stein threw four touchdown passes including two to Heskamp and one to Davis. Davis also returned a fumble for a touchdown in the third quarter. Solomon 46, South Central 44 – Solomon held off South Central with a key two-point conversion for a 46-44 win. The Gorillas led 24-12 in the second quarter before South Central rallied to take a 28-24 halftime lead. Solomon quickly regained the lead in the third quarter, but South Central battle back aided by four Gorilla turnovers. Solomon scored with just over 3 minutes remaining and got a key conversion to lead 46-36. South Central scored with 1:45 remaining to pull within 46-44, but Solomon recovered the onside kick. Jake Tiernan passed for 272 yards and two scores for Solomon, while Gerald Morehead rushed for 198 yards and four touchdowns for the Timberwolves. St. Francis 70, Hodgeman County 24 – Quinton Cravens passed for 171 yards and four scores as St. Francis routed Hodgeman County 70-24. The Indians also rushed for three scores and got a defensive score and a touchdown on special teams in the win. The playoff win is St. Francis’ first since 2009. Axtell 46, Centre-Lost Springs 0 – Axtell had no trouble with Centre-Lost Springs in a 46-0 shutout that ended at halftime. Colton Buessing passed for 236 yards and four touchdowns to lead Axtell to the win. The Eagles will travel to Caldwell in the state quarterfinals on Saturday. Caldwell 72, Colony Crest 44 – Caldwell went on the road and won at Colony-Crest, 72-44. The Blue Jays raced out to a 20-6 lead before Crest pulled to within 28-22 at halftime. Caldwell scored first out of the locker room and eventually led 50-28 after three quarters. Pike Valley 26, Chase 24 – Pike Valley beat Chase for a second consecutive season in the first round, but it wasn’t easy. The Panthers led 18-12 at halftime before Chase tied the game at 18 at the end of the third quarter. Pike Valley regained a 26-18 lead, but the Kats responded with a touchdown but could not convert the two-point attempt. Argonia-Attica 48, Hartford 0 – Argonia-Attica started the game with a safety as Hartford was flagged for intentional grounding. Alec McDaniel rushed for three touchdowns and passed for another as the Titans rolled to a 48-0 first-half win. Minneola 68, Satanta 44 – Minneola eliminated Satanta for the second straight year in the first round of the playoffs. The Wildcats lead was 22-12 at halftime and Satanta pulled to within 22-18 in the third quarter before the scoring barrage began. Minneola led 48-30 at the end of the third quarter. The Wildcats beat the Indians 44-32 last season. Victoria 52, Triplains-Brewster 6 – Victoria won for the 21st consecutive time as the Knights pulled away from Triplains-Brewster. Brady Dinkel caught a touchdown pass and Lane Kisner rushed for a score as Victoria built a 16-0 first-quarter lead. Joe Dortland and Parker Riedel added touchdown runs as the lead grew to 30-6 at halftime. Ingalls 74, Ashland 28 – Ingalls jumped out to a 20-point first quarter lead in rolling past Ashland 74-28. The Bulldogs avenged a 56-42 regular season loss to Ashland back in Week 4. Sharon Springs-Wallace County 65, Otis-Bison 20 – Wallace County jumped out to a 20-8 lead in the first quarter only to see Otis-Bison come storming back. Wildcat quarterback Eric Gfeller broke a long touchdown run right before halftime to give Wallace County a 28-20 lead at the break. The second half was owned by Wallace County as they put up 37 points to win 65-28. Wallace County standout running back/linebacker Luke Schemm was air-lifted after collapsing on the field.